This month is a great one if you’re playing your favorite casino games at bgo casino. There are several promotions and competitions you can join if you feel like it and there are so many free spins and cool prizes up for grabs. Make sure you visit bgo casino now if you don’t want to miss out on anything! One of the awesome promos during November is the one called “Retro Rewind”. All you have to do in order to join the fun is a deposit that you wager. 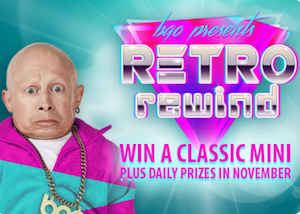 Bgo will give away retro prizes every day such as watches, jukeboxes and other surprises. Remember that you’ll have to opt-in at bgo’s promo page. After that you will get a ticket to the daily draw as well as the big draw at the end of the month when you deposit and wager £15. However, you will get two tickets if you deposit and wager £25 instead! Make sure you play the chosen games which you’ll find at bgo’s promo page as well. Also you will get 10 free spins on Space Invaders for every ten tickets you collect. And when November comes to an end bgo will give away a retro Mini car worth £15000. Another big competition at bgo right now is “November Rocks” in which you can win a VIP Rock Star Experience in London together with £1700 in spending money. Just make sure you spin the wheels on any of the videoslots Jimi Hendrix, Motörhead or Guns N’ Roses at bgo with at least £0.20 per spin. For every 50 rounds you play you will earn a ticket to the big prize draw. You have until next Wednesday, the 16th of November, to collect tickets. One lucky player will win the trip to London and after that bgo will give away another £22 239 in cash as well as 100 000 free spins! As you probably already figured out by now the boss is feeling rather generous and you can win a share of none the less but £1 000 000 during November. From Monday to Friday every week until the 27th of November bgo will give away cash prizes worth £60 000. If you want a chance to win you will have to wager at least £10 on any of the selected games that week. Bgo casino sure goes big this month!